Excitement has been building all summer long for the Pullen Heavy Industries race weekend that will take place at Beech Ridge Motor Speedway (ME) in late September. The anticipation has been for several reasons. 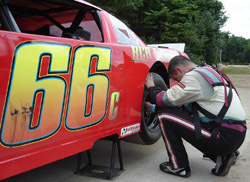 Some drivers like Tardiff, who races weekly at Beech Ridge, were there to do a little fine-tuning. Other drivers, like PASS regular and former Beech Ridge driver Whitten, were there to reintroduce themselves to the track. Already, it appears that the 300-lap race could be a civil war between Beech Ridge regulars and the big guns of PASS. 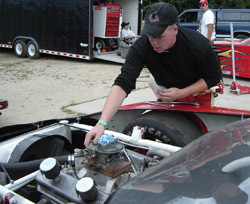 Mike Murphy works under his hood. 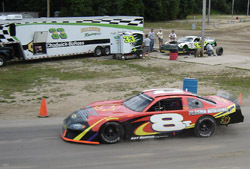 One unique part of the PHI race weekend, at least in New England, will be that many weekly Pro Stock teams that might be outgunned by the PASS teams have the opportunity to enter a 50-lap Outlaw Late Model event. 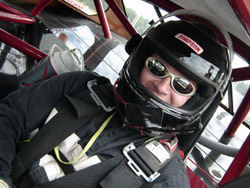 Young New Hampshire driver Mike Murphy plans to be doing just that with a car that he hasn’t been able to race much lately. He was there to test it this weekend. It will be the first appearance of the IBG-PASS Pro Stocks to Beech Ridge ever. The track is right in the backyards of several teams and has a rich history of Pro Stock racing. It’s also been several seasons since Beech Ridge has held a major open show. Ticket sales and competitor interest have been said to be high already for the September 23rd-25th race and several teams got a jump start on their plans by taking part in an open test session at the track on Sunday. Drivers who were there to prepare for the PASS and two barrel Pro Stock/Late Model portion of the show included Richie Dearborn, Donnie Whitten, Tony Ricci, Alan Tardiff, Garry Johnson, Bobby Cabral, Mike Murphy and PASS Modified driver Katie Hagar. The test session helped to uncover some problems in advance for Murphy, son of famed car builder Pat Murphy. One thing is certain. No matter what division a competitor plans to enter, excitement is building for the Pullen race weekend. Speed51.com will continue to bring you all of the news leading up to the Pullen Heavy Industries 400 race weekend featuring the IBG-PASS Pro Stocks, Outlaw Late Models, PASS Modifieds, Limited Sportsmen and Wildcats (Strictly/Street Stocks). Bobby Cabral works on his #66c machine.